To commemorate World Day Against Child Labour, BBC News has spent a day with child miners in the Democratic Republic of Congo, who work for about one dollar per day. 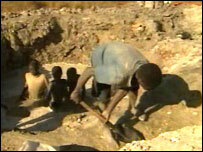 At Ruashi mine, in the Eastern province of Katanga, almost 800 children dig for copper and cobalt. At eight years of age, Decu has never owned a football, or played a video game. He has no computer, and no TV. He's never been to school, though he passes young pupils in uniform every morning, as he sets off for work. He is a child, born into poverty in what could be one of the richest places in Africa - the Eastern province of Katanga, in the Democratic Republic of Congo. There are vast mineral deposits beneath the soil here, but this treasure trove has always benefited the leaders not the people. Decu's day begins at dawn. Usually he does not eat, just drinks a little water. Then he sets off on a two-hour walk with his twin, Kaba. Both have torn sweatshirts and trousers with holes. By their side is Cedric, their friend and neighbour, who is 15. He's a quiet boy with an earnest look. He has no shoes, just flip flops on his feet. Cedric used to go to school, but now his family can't afford to send him. By seven or eight each morning, the boys arrive at Ruashi mines, where huge mounds of red, brown and grey soil scar the landscape. 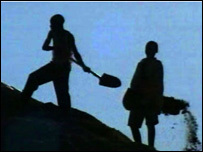 They join the ranks of child miners - close to 800 of them, working alongside fully grown men. It's all unofficial, but it's also highly organised. We stand at the top of one enormous mound of silky soil, looking down into a crater about 40 metres deep. All the way down there are ghostly-looking figures digging for copper, coated in choking grey dust. There are no safety standards. No-one wears a hard hat. In the midst of all this, there are some boys as young as Decu and Kaba, working with bare hands and bare feet. Many of the local middlemen prefer to use younger children, because the older boys get paid more. The children here can be as young as five or six. "We saw boys standing waist deep in toxic water, washing soil away from nuggets of copper. One, Antoine, told us he was ten. For Cedric and the twins, the first job of the day was sifting away soil from mineral deposits. It was heavy work, especially for Decu. As he worked, he told me he wanted to be like children in Europe. "They go to school," he said. "I saw them on TV. But my father can't afford to pay my school fees. That's why my life is so hard." As the day wore on the twins dug for nuggets of copper with their bare hands, but didn't find much. A local buyer gave them a few grubby notes, enough for one small pastry each. Cedric moved on to cleaning cobalt with his bare feet, in a lake of toxic water. Between the three of them that day, the boys did not make enough to buy an evening meal. The new owners of this mine, Metorex Limited from South Africa, would not give us an interview on camera. They inherited the informal miners when they bought the mine. The company says it's a difficult situation because so many local people depend on the mine. A manager at the site told us that they do not condone child labour and, in time, they want all the informal miners out, including the children. The irony is that without what they can scrabble together at the mine, life for Cedric and the twins might be a lot worse. Orla Guerin's TV report can be seen on BBC 1's 10 O'Clock News at 2200 BST on Monday.